A number of new features will soon be released in the upcoming version 1.5.6. Interested to explore them now? We just opened a public Beta program for this release. Please feel free to join. Whilst our internal tests were look very promising, there is always a chance that the Beta version might have some flaws. If you find a problem, please let us know to improve the Photoxor Toolkit. Flash/M: A new screen for additional flash calculations. Cloud storage: Personal setting can now be imported from and exported to cloud storage. 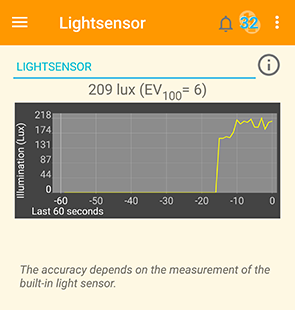 Light sensor: graphical presentation of light sensor readings. Settings: Calculation screens may be kept always on. Permissions: The new permission model is now supported. This screen is new; please let us know if you find any problems or your recommendations for improvements. This calculation is primarily used to calculate the output power required for a fill flash in situations where you have a bright background and need to get some more illumination onto your object. Now you are able to keep your personal settings on cloud storage, such as Google Drive. Please note that the installation and configuration of your cloud storage access is done outside and independent of the Photoxor C1 Toolkit. Light sensor readings are done continuously. We now present a graph of readings for the last 60 seconds. A new Tools screen for the light sensor graph is available as well. 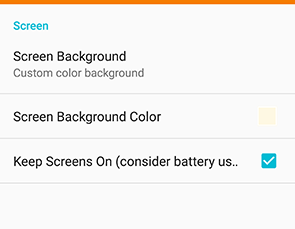 Android 6.0 (Marshmallow) introduced a new permissions model (see here for some information). When you run the application on Android 6.0 or later, permission are granted by the user while the app is running. You are now able to deny particular permissions, and also revoke already granted permissions. Please note that in case permissions are not granted or revoked, the application might not work correctly and is limited in functionality. This new setting allows you to keep calculation and tracking screen always on. Please keep in mind that the screen will drain you battery faster. The DoF Near / Far screen now works correctly when changing aperture. Both DoF screens better support the focal and aperture range of a lens and perform calculations within these lens constraints.